If this is country life, then sign this city boy up! After a breakfast that would make Nigella Lawson swoon — leftover tiramisu and a bubbling glass of prosecco — I’m out the door of my rented farmhouse on an expansive olive estate and heading down a dirt path in the foothills of the Apennines. Theoretically, I’m here to work the fields at Umbria’s annual olive harvest. But as I find myself reporting for duty in the genteel gardens of a Renaissance palace, I’m the first to concede that “working the fields” in this case is meant in the loosest possible sense. Still, this is no ordinary olive farm, and Umbria — a region in Italy’s heartland — is no ordinary place. My little band of agriculturally challenged cohorts and I have come to this estate for a literal taste of “agriturismo,” or farm tourism, in a part of Italy that some derisively dub the poor man’s Tuscany. And let them keep calling it that. In the meantime, they’ll find me enjoying La Dolce Vita country-style at the dining table of an Umbrian vineyard, eating white truffle pasta washed down with a nicely aged Sagrantino for half the price of the same in Florence. Or perhaps, as they and a million of their closest friends take in the Uffizi Palace, I’ll be grazing at the chocolate festival in the Umbrian capital of Perugia, sampling a steaming brew of bitter mocha and fig with a side order of pistachio fudge. If those same Tuscan toadies came calling on this particularly fine fall morning, they’d find me greeting my olive-picking teacher, Vittoria Iraci Borgia. Her family — a blue-blooded brood that is one part Medici, one part Borgia — is bottling some of the best extra-virgin olive oil to come out of this beautiful, bountiful boot of a country. I said they’d find me here. I didn’t say they wouldn’t laugh. “Oh, I see,” I respond, not really seeing at all, since she seems to be succeeding at gently tugging olives off with her little tree rake deploying the exact same motion that I’d used. I try again, somehow managing to mangle an olive. At this rate, she won’t need the cold press. Still, I do better than a friend who arrived late for class, and whose technique looks like that of a kitten tackling a scratching post. If we keep bumbling on like this, I have visions of an olive food fight along the lines of the Italian grape-stomping skit from “I Love Lucy.” So my friends and I hang up our tree rakes and wisely join Borgia, the proprietor, for a round of olive oil tasting in her garden. 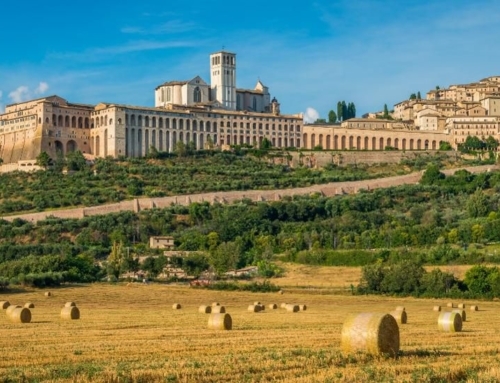 Like Borgia, who’s picking olives in a well-worn sweater and comfortable jeans, Umbria is a noble land that is, at its core, also the salt of the earth. A high Etruscan civilization thrived here in pre-Roman times, erecting great cities and creating precious works of art before the first bricks were laid in Paris or London. The region is hot these days in part because the cool new dude wearing the funny hat in Vatican City took his name from St. Francis of Assisi, the Catholic saint whose birthplace shines as one of Umbria’s many hilltop towns worthy of day-tripping. But for those whose religion tends to find them worshiping more at the altar of Italian cooking, Umbria’s range of agriturismo offerings (olive estates, working farms and vineyards willing to host the hungry guest for a few hours or even a few weeks) presents a far quicker path to paradise. For me, a recent trip back to Umbria was, in a sense, a homecoming. My first real glimpse of the world beyond America’s borders came here in 1987. 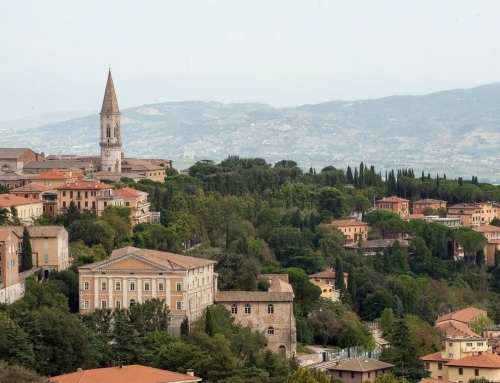 After much begging and pleading from me, my parents sprang for a semester abroad in Perugia at the aptly named University for Foreigners. From that magical summer onward, the misty vistas of the central Apennines, the fresh-from-the-farm cooking and the comforting intimacy of Italian culture would become my benchmarks for judging the quality of life everywhere else. One of the magical qualities of Umbria (and, to be fair, virtually all of Italy) is that this is a place where a casual dinner can still feel like a life-altering experience. “Benvenuti!” chimed Mamma as a group of friends and I planted ourselves at a table inside Il Cerreto, a restaurant — and perhaps the pinkest place I’ve ever seen in my life — operating as part of an Umbrian farm not far from the ancient village of Torgiano. “Mamma’” is actually Doriana Frascarelli, matriarch and cook in the family-run kitchen. But to know her is also to know that you had better call her Mamma. And don’t let all that pink on the walls fool you, either. Down on this farm, the family slaughters pigs out back to make its own sausage, a little culinary adventure that overnight guests can participate in if they have the stomach for it. My stomach, however, was far more interested in the pasta, which Mamma makes fresh at an open table in the dining room for all the world to see. Dinner here is interactive, and one by one, we took turns trying to roll out her locally famous cerretini — a short, fusilli-like pasta made from 70 percent barley and 30 percent wheat. In a terrible deja vu of the olive-picking debacle, mine came out like the squashed dwarf-cousin of fettuccine. In the quilt-work that is the Italian countryside, Tuscany’s well-worn Chianti Hills are so often billed as the most beautiful patch. But if your heart skips a beat there, pack your nitroglycerin and head for the preternatural Umbrian landscape around the high village of Castelluccio. As we drove in our little Alfa Romeo through the Piano Grande, or Great Plain, on our way to that enchanted hilltop town, the scenery abruptly switched from quaint vineyards and roadside farmstands to a vista that seemed more Montana than Italia. At more fertile times of the year, dizzying sprays of wildflowers bloom in the plateau, igniting the panorama with a fierce color stretching as far as the eye can see. In the fall, the great plain changes like a chameleon, becoming a monochromatic blanket of green velvet. Tiny Castelluccio itself feels more Alpine than Umbrian, with steep mountain roads and fare on the menus that tends toward hearty lentil stews and ragu of wild boar. We let out our inner pigs, dining on all of the above before hitting the local delis — places that I’m convinced every Italian American will shop in as if they’ve never seen food before — to stock up on truffle sausages, biscotti and dried beans to take home. But this is Italy, and you want wine. Or at least I did, and two days later, we were pulling up at the vineyards of Arnaldo Caprai. Situated at the end of a regal driveway lined with rows of needle-shaped cypresses, the estate boasts a hilly panorama that’s an impressionist painting in autumn, with burnt siennas and mustardy yellows peppering the green of the vine rows. Located in the shadow of the Umbrian city of Montefalco, this is Sagrantino country. “Be patient, my friend, be patient,” counseled Marco Caprai, son of Arnaldo and overlord of the cellars here. In the cool interior of the winery, in front of vast rows of aging wines, he had tempted us first with a series of fermenting whites that will eventually form part of his 2013 vintage. But I came for the Sagrantino, a red so big and bold, it could take on a Rioja and a Bordeaux in a bar fight and still win with two hands tied behind its back. Finally, a grinning Caprai, whose family helped refine and reinvent the once humble Sagrantino grape in the 1970s, produced an inviting quarter-glass of the ruby liquid. Ah, wine tasting. Finally, something I’m good at! I drank. And in the flavor, I could taste Umbria. The bursting, comforting, warm heart of Italy. Drinking it made me hungry, and 90 minutes later, we’d climbed out of the cellars and into the kitchen for a “cooking class” with the vineyard’s singing chef, Salvatore Denaro. Within moments, he was bouncing from sink to oven to cutting board like a hyperactive Italian pinball, all the while sprinkling around little pearls of cooking wisdom like pixie dust. A local legend in these parts, the Sicilian transplant to Umbria is known for belting out an impromptu aria while cooking. Though Placido Domingo’s job may be safe, Denaro could certainly teach Le Cordon Bleu a thing or two. And in every bite of this food, in every sip of this wine, in every laugh at this table, a reality sinks in. If this is the poor man’s Tuscany, maybe it’s better to be broke.